So, the new addition to my ever-growing herd of equines is “Eddie”. 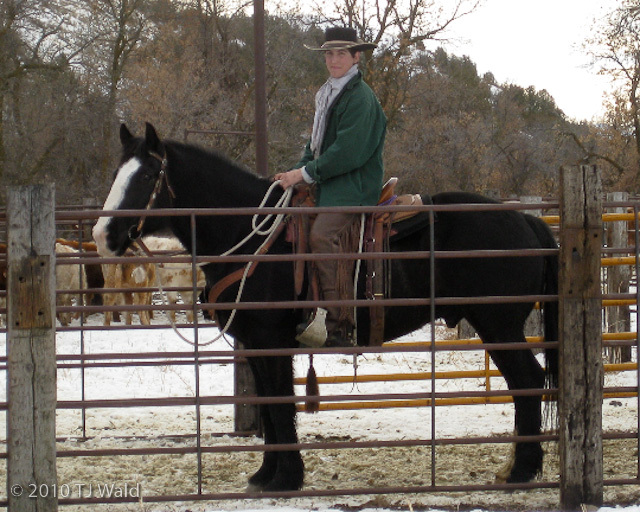 Eddie is a half-shire, half-Quarter horse and is originally from Small, Idaho; where he was raised by Butch Small. I started wanting a half-draft one calving season when a good part of our cow herd was made up of old, sorry, counterfeit, stubborn, and mean red angus witches. I swear, we had to pull three quarters of the calves from those brain-dead sows; that meant trying to get them to the barn, so we’d get horseback and tackle the issue. On the way back with the cow, they’d do one of two things; either sull-up and lay down, or run slick off and get roped (awesome!) in which case they’d sull-up and lay down anyway. Well, you can’t drag a mature mama cow very far with a normal horse, so I vowed I’d get a bigger model. A year or two passed and I put the word out that I had to have a draft, well a friend of mine in Idaho asked around and came up with a 6 year old black with a blaze and a couple white socks. He gave me the guy’s number and as it turned out he was a friend of dad’s from the rodeo days! Well, I called him up and we made a deal that during my Christmas break dad and I would drive down, try the horse, and take him home if I bought him (I was pretty convinced already!). On that Saturday, dad and I got up early and headed west. We met Norm, the friend that found Eddie, at Dubois and followed him to Small, Idaho; where the Small Ranch is located. That afternoon I got to ride my half-draft and help move some cows on him, and enjoyed it thoroughly! The next morning dad and I got ready, bid farewell to Butch’s family, and started the trip home over snowy Monida Pass. I somehow ended up with Eddy’s mom too, she’s almost full Shire, so I’m now in the half-draft business more than I thought!! 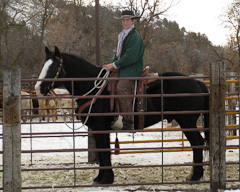 Jackson Wald is a featured columnist for High Minded Horseman and a fine example of Montana’s ranching youth. He can generally be found on the family ranch, working cattle and his latest colt project; usually at the same time.